You'd think Samsung might have learned from Apple's mistakes when it comes to fingerprint technology, but you'd be wrong. Just as the iPhone 5S's Touch ID fingerprint scanner was fooled by hackers mere days after the phone's release, the Samsung Galaxy S5's has already been tricked as well ... with the exact same method. Just like the iPhone's sensor, the Galaxy S5's fingerprint-based security can be bypassed using a special rubber mold. The delinquent who wants to create such a bypass key would need to first lift the phone owner's fingerprint and then stamp it onto rubber - no small feat. Does that mean there's nothing to worry about? As TechCrunch points out, you might have bigger problems if someone is going so far as to duplicate your fingertips just to get into your phone. 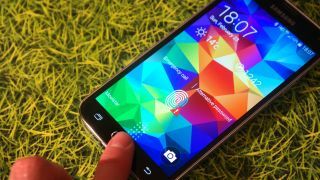 However, the particular implementation of the fingerprint reader in Samsung's Galaxy S5 makes this hack-around slightly more problematic, since unlike on the iPhone S5, owners of the latest Galaxy can use fingerprints to authenticate with PayPal. So someone with access to your fingerprint could potentially also have access to your PayPal account, which is clearly not a good thing. Of course, as has been said, either way the criminal will have access to your email accounts on your phone, but once that's done, they can do just about anything anything. You know what doesn't have a fingerprint scanner? The Samsung Galaxy S4.